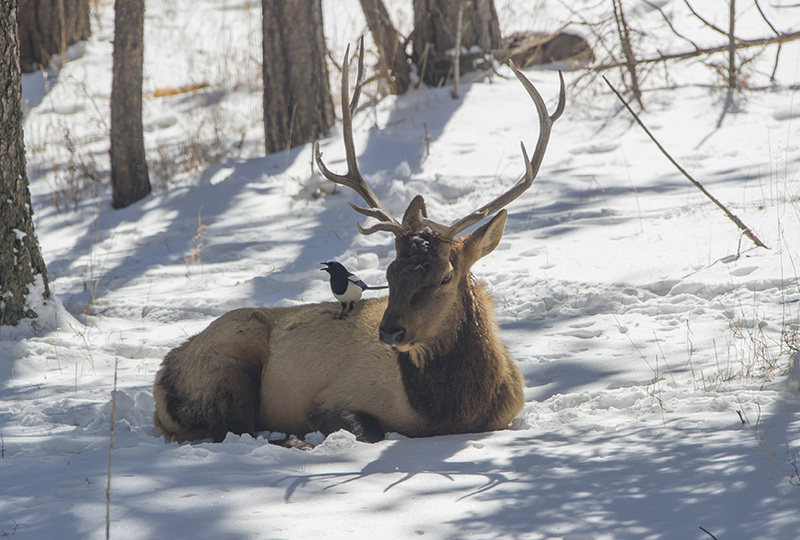 A Magpie perches on the back of a bull elk resting in a pine grove in Evergreen CO. after the March 9th storm. Living near the Upper Bear Creak drainage from our closest fourteen thousand foot peak Mount Evans provides a remarkable view into the lives and habits of a lot of wildlife. It’s not unusual in this montane environment to see unique animal movement and behavior this time of year at 8000 feet. Many of the migrating birds and some of the winter stragglers have been seen recently in the area. The Pine Siskins, Red Wing Black birds and several American robins have already frequented our area and have joined the throngs of Magpies, Crows, Chickadees and Finches . Mule deer have been shuffling through the area all winter but the elk ( Wapiti ) are just starting to move more frequently. Part of the Mt. Evans elk herd has been holding in our area for several weeks now. Nine bulls decided our property was a good respite for the day today. Most came to graze on some dormant grasses, bed down, rest and soak up some sunshine. But one unruly boy decided to take on our bird feeders to pilfer a little bird seed. It was quite amusing but as you can imagine some what messy and destructive. It’s all in good natured fun and simple amusement. 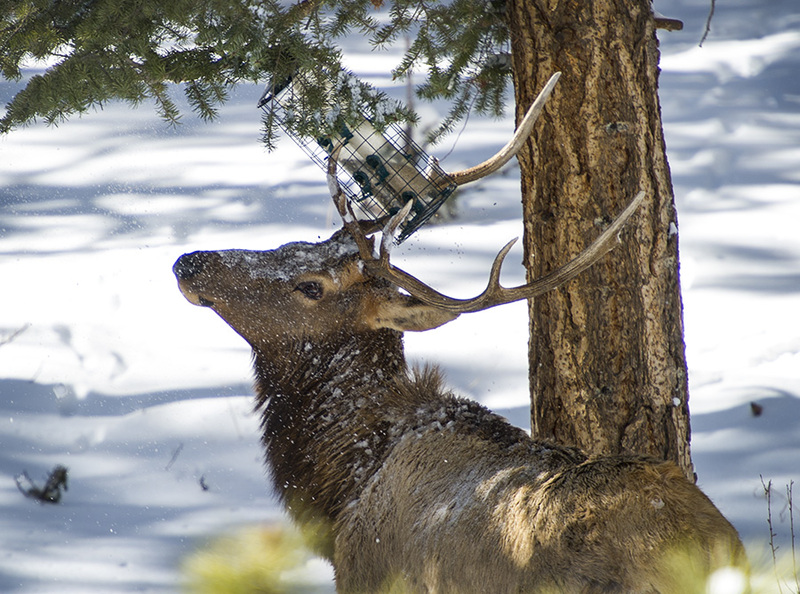 A bull elk decides to poach some bird seed from a feeder by tipping the feeder with his antlers.